Mentally preparing to swan out all over BEA on Thursday. There's an awful lot I am excited to see. In the meantime, I am sitting hungry in the unfinished basement of our new store, thinking about Banana Yoshimoto. Specifically, Kitchen. Love and death aside, it's about food and the lonely comfort of a kitchen. The writing is clean and spare, touched with melancholy; it's a tender phantom of first novel. I was fifteen when I read this and would still like to walk around a city supermarket in the middle of the night with Banana Yoshimoto. Books about food and food relationships are out there in plentiful number but often feel off to me. While hugely unprepared to discuss say, the madeleines of In Search of Lost Time, I thought I could deal with the years 1993 & 2003 and two books I thought hit a perfect, clear note. The other? A lifelong love of all things Pépin began with The Apprentice. 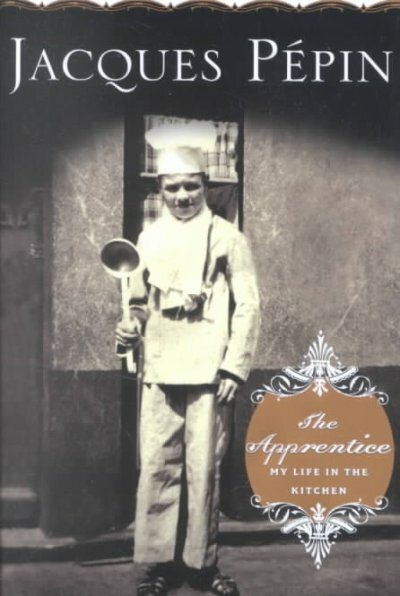 From working in the restaurants of his family as a child in rural France to a rigorous apprenticeship in the classical kitchens of Paris restaurants, to cooking for the Prime Minister, the stories continue onto his work with Howard Johnson's, teaching, and his famous collaboration with Julia Child. This is a perfect memoir, covering an enormously busy span of time with great warmth, hilarity and surprising speed. I may have read this in one sitting but return to revisit chapter recipes often. Maman's Apple Tart! I had the opportunity to hear Pépin speak at Astor Center last year. In a room filled with people, what I remember most is that he walked around and made sure to shake everyone's hand before starting. That content of character is part of what makes his stories so enjoyable. Seriously, the best. I love food writing, but haven't read either of these. Once I come down from my expected BEA hangover I'll have to try to remember that. Oh man I want to read that Pepin book.